As I mentioned in my previous post, I have been loving mason jars lately. 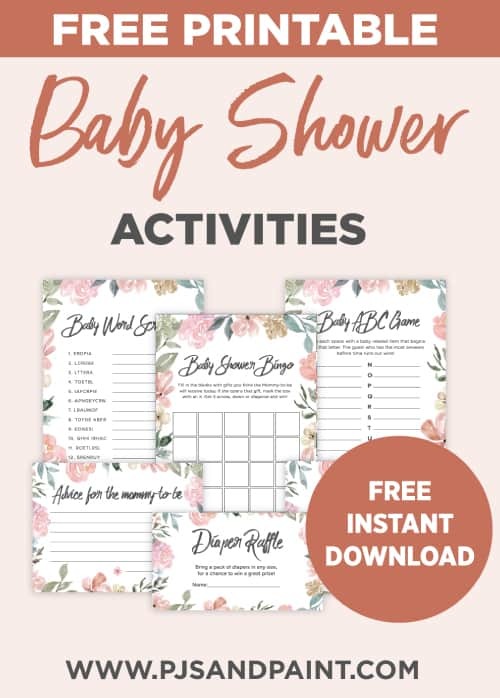 There are so many fun things you can do with them! To go along with with my snowman, (if you haven’t already, check out my post on How to Make a Mason Jar Snowman!) 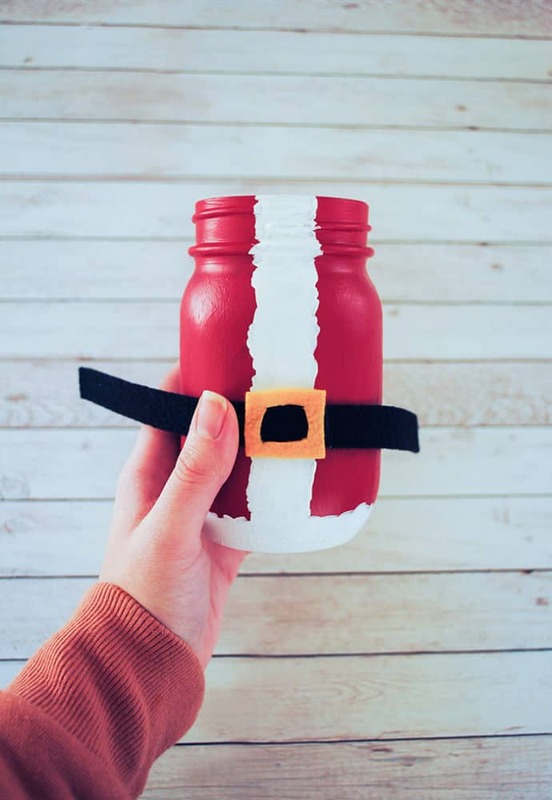 I wanted to create a mason jar Santa. 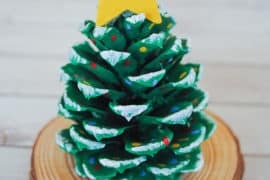 This is another very simple craft that can really get you in the holiday spirit. Let’s get started! First, you’ll need to paint your jar red. 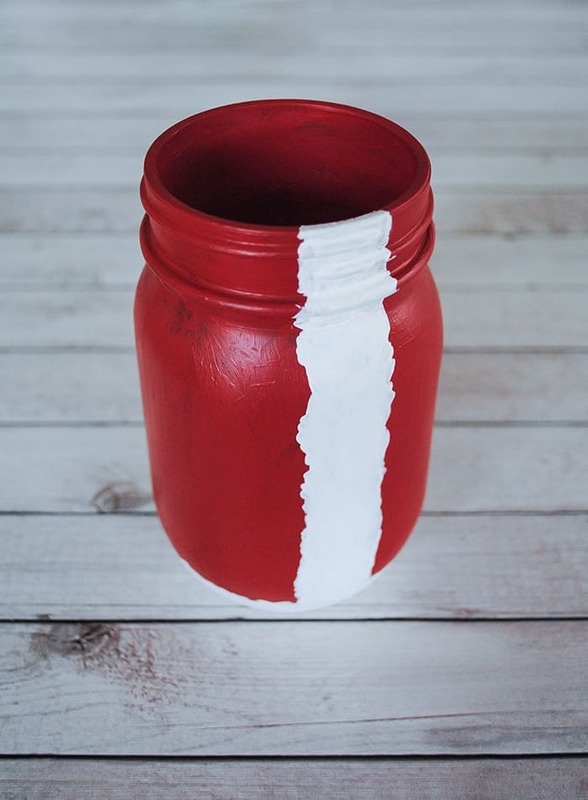 I used acrylic paint and it took 2 coats to fully cover the glass jar. I painted the inside of the jar as well. This isn’t necessary, but if you don’t end up putting anything in the jar, having the inside red makes it look a bit more finished. 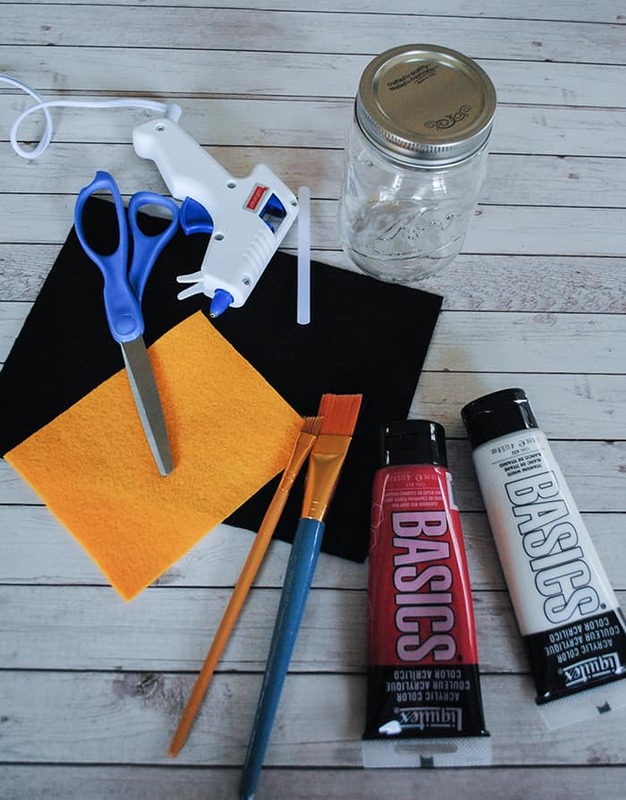 Make sure that the red paint completely dries before moving onto the next step. After everything is dry, I painted the white fur of Santa’s jacket down the middle. Feel free to give it some jagged edges, no need for perfect lines here! I also turned the jar upside down painted a bit of fur along the bottom to represent the bottom of his jacket. The next step is to cut your felt. A standard size piece of felt from the craft store fit perfectly around my pint size mason jar, but just double check to make sure it’s long enough to go all around. I’ll be honest, I didn’t measure mine out exactly, but I’d say I cut an approximately 1/2 inch wide strip of black felt for his belt and about 1×1/2 inch rectangle of gold/yellow felt for the belt buckle. To cut out the center of the belt buckle, you can either take an exacto knife and cut out the middle, or fold the rectangle in half and use a pair of scissors. Once your felt is cut, put a dab of hot glue where you’d like the black belt to be. After that is in place, add some more dabs of glue all around and position the belt in place. If your strip of black felt is longer than you need, you can either cut it off or overlap it. 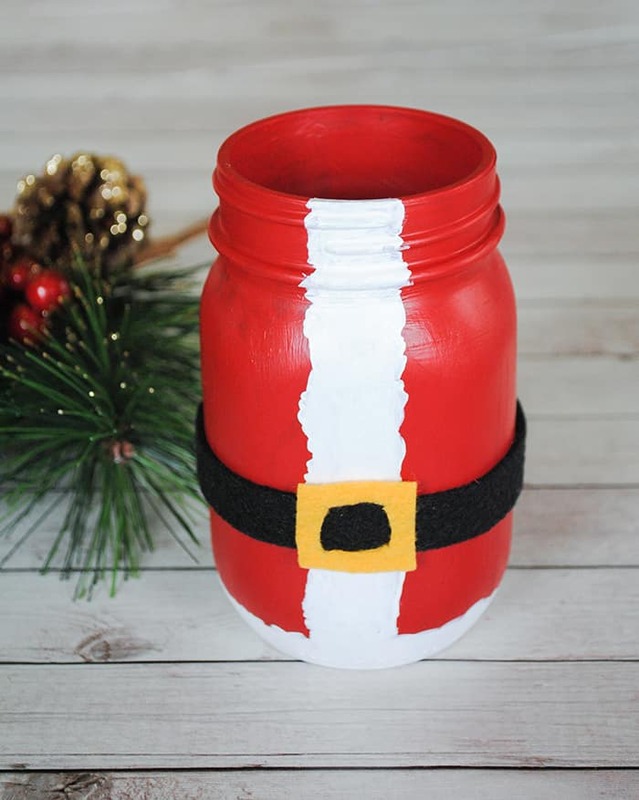 Finally, glue on the belt buckle and your mason jar Santa is ready to go! Display on it’s own or fill with candy, screw back on the lid and give as a gift! If you have a few more mason jars laying around, check out my post on How to Make a Mason Jar Snowman! 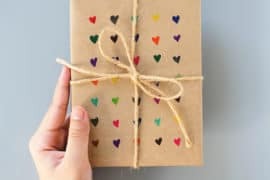 Did you try out this craft? 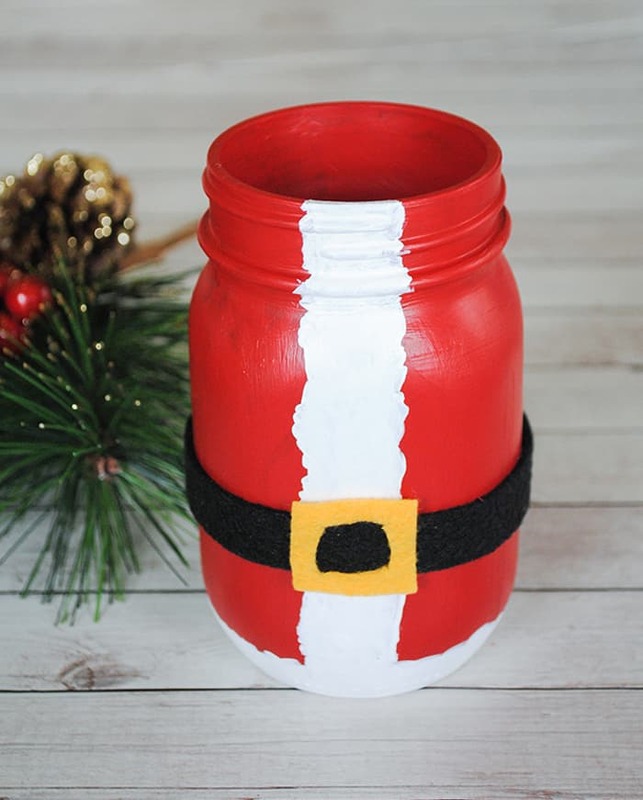 Post a picture of your mason jar Santa on Instagram and tag @pjsandpaint and we might feature you in a future post! Merry Christmas and Happy Crafting! It is a wonderfully creative idea! I love it! This is awesome. 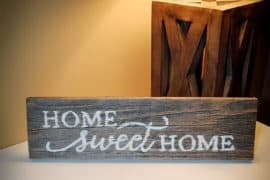 I’m not too crafty, but think I could handle this one. Definitely! Just paint and some hot glue! Pjs and Paint features printables, craft tutorials and creative business advice. 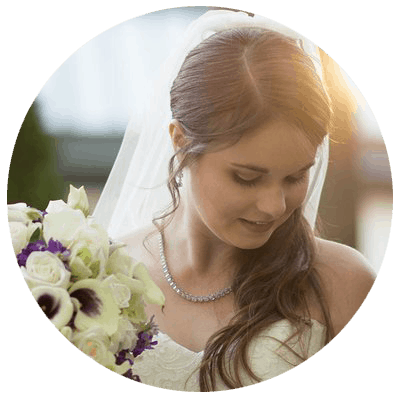 Founded by graphic designer and mom, Kelly Crean. Please note that some blog posts may contain affiliate links. This means that we may earn a small commission for products/services we link to and recommend. This commission comes at no extra cost to you.